This Super Famicom Nintendo Switch Skin is a Work of Art #ArtTuesday « Adafruit Industries – Makers, hackers, artists, designers and engineers! Unless it has the neon colored joy-con controllers, the Nintendo Switch is a boring console to look at. Yes, most consoles are also black bricks, but there is really nothing special about the Switch’s default design. One clever Switch owner didn’t want to settle for that and gave their system one of hell of a makeover. Prepare yourselves to see a true masterpiece, my friends. A user by the name of Clown TV from South Korean website Ruliweb has made a thing of beauty. He created skins that make the Switch resemble the old-school Super Famicom (the Japanese SNES). He even went so far as to create skins for the Switch dock. I’ve seen a lot of custom console skins in my day but this is one of the best. 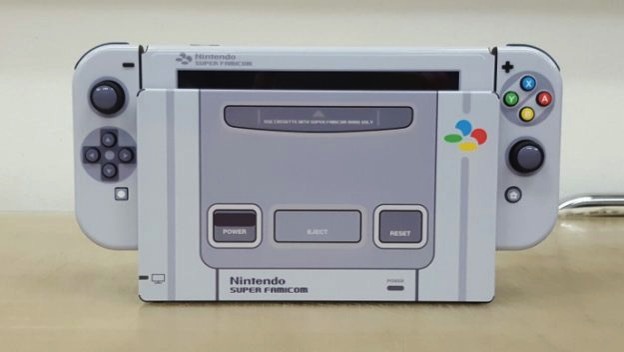 Seriously, I want to contact this person to see if they can send me a pack or two of these Super Famicom Switch skins. This is simply stunning. As you can see from the video above, applying the skins takes some skill. You know putting skins on a system is serious when you need to use a blow drier. It is unclear how long this entire process took. It certainly doesn’t look like an easy project to complete. Given the final results, I would wager to say it took the better part of a day.